So, you have decided to ship your car to a new destination; a great option that will save you a lot of time. But, when you start looking at the quotes from different companies, you may find yourself wondering why the prices are so high. You are going with this method to save money, after all, so why are these companies charging such high rates to do the job? Well, there are a lot of factors that go into moving cars and other types of vehicles, which can raise the price drastically. Everything from the kind of car you have to the conditions of the season can affect the amount a company quotes you. 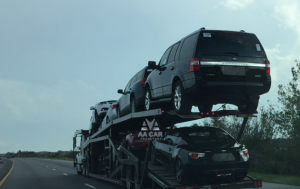 Here are some of the most significant factors that can affect your car transport price. You cannot ship your car without gas, and the truth is gas is not cheap these days, regardless of who you are, where you are, and even the kind of gas you use. For truck drivers who rely on diesel gas, however, they can expect to pay upwards of $3.21 per gallon to fill up their tank. It may not sound like a whole lot, but it is a number that can add up quickly. However, as long as the political unrest continues in the countries where the gas comes from, prices will remain high and may even continue to rise. While the government is looking for alternative sources, such as drilling off the of the East Coast of the U.S., such ideas face significant opposition from the public for fear of potential damage such drilling can cause. Because of this, as long as these issues exist, gas prices will remain high, and car transport companies will charge higher transport fees as a way of dealing with the additional costs they encounter. Gas prices are not the only factor that affects the cost of car shipping. How a car is to ship can also change the price; do you go with an enclosed or open shipping method? Enclosed car shipping is what companies use for classic cars, sports cars, and motorcycles; these are all vehicles that require more protection and care, so covering them from all sides will ensure no damage will occur. With enclosed car shipping, drivers may also take different routes to better ensure the safety of the vehicle, which altogether makes enclosed car shipping more costly. On the other hand, there is also open car shipping, for regular trucks, SUVs, and sedans. With open car transport, the car does not get the extra protection of a closed container; but, it will also be a lower cost option. It may not seem like a big deal, but whether or not the car works can also play a role in the cost of shipping a car. When a vehicle cannot be driven right onto the back of a truck, the driver has to use specialized equipment to load it, which may require them to find a different truck or rent the specialized equipment to complete the job. As a result, this means more work for them before they can even start driving. As a result, if your car is not properly functioning at the time of pick-up, you may have a bit of an increase in price. So, be sure to mention any issues with the car beforehand, so that the driver and company know exactly what they can expect. Hiding it can just make for a rough partnership, an unhappy driver, higher fees, and even a driver who turns down the load. Another major factor that will affect the cost of shipping a car is the distance that the driver has to go. The further you are looking to move a vehicle, the more you can expect to pay. The higher price will help to account for the refueling, food, and lodging costs that a truck driver may encounter on their trip. Drivers are required to take breaks after long hours of driving, to ensure they get some rest to avoid any potential accidents. Although some truck drivers may have trucks equipped with sleepers and mini-fridges, others are not. So, a company may charge more to make sure their drivers can get their much-needed sleep and food before they continue on their way. While everyone on the road is required to have some form of driving insurance, commercial truck drivers need a particular kind of insurance. This insurance is part of what the owner of the shipping company provides to their drivers and is one of the most significant operating costs that an owner-operator will have to handle. Trucker insurance can cost, on average, anywhere between $3,000 to $16,000, with the cost having increased over the last couple of years. The cost of insurance will also naturally increase depending on a wide range of factors. The owner’s credit score, the amount of CDL experience, having proper signage on all company trucks, and whether or not the premium gets paid in full are all factors can that affect the cost of the trucker insurance. Regardless, to deal with the high cost of trucker insurance, you can expect to pay more when it comes to shipping large objects, especially cars and other vehicles. Another factor that plays a role in the price of transporting a vehicle is the ever-changing requirements set forth by the Department of Transportation (DOT). Before, truckers kept paper logs of their time spent driving and resting, but in recent years these paper logs have been replaced by mandatory electronic logging devices (ELDs). These ELD systems are meant to create an easier-to-manage, more efficient method of logging times in for drivers, but they also mean added costs for the company. This is because the company has to sign a contract with another company so that they can have a well-maintained ELD system for their drivers to use while on the job. However, to compensate for these extra costs, the company then has to raise their shipping prices. Otherwise, they would struggle to make a profit. These days, the DOT is becoming stricter with the way that they deal with truckers and shipping companies. Now, the rules they have laid are more enforced, with severe penalties for those that do not obey them. A company that does not adopt the ELD system, for example, may find themselves forced to go out of business, as the DOT had made the system mandatory for all shipping companies and truck drivers. Some states may also have rules of their own that truckers are required to follow to function. While this added enforcement is good because it holds companies more accountable for the drivers and the hours they work, it also creates another problem: higher overhead costs. These higher overheads can be difficult for smaller companies to pay, which can also force them to have to shut down their business operations. Regardless of who you are, weather and seasonal conditions can have a significant impact on drivers everywhere. This is especially true for truck drivers tasked with transporting cars and other vehicles throughout the country. Heavy rain and snow can make transporting a car more difficult, though not always impossible. However, to help make up for these difficult jobs, there may be an increase in a company’s rates. Similarly, changing seasons can have a massive effect on the cost of car shipping. Like with travel, there are peak times of the year—the summer and spring tend to be some of the busiest—where shipping is more sought after, raising the demand for shipping companies who, in turn, take advantage of this demand and raise their prices. However, during most of the fall and winter, except for January, things slow down, and car shipping prices see a decrease. Car transport companies are a business, and it certainly not a cheap one. Between the costs of maintaining their trucks and drivers, to the price of gas, down to paying for their website domain, the costs add up. To be able to compete and make enough to survive, transport companies need to stay on top of market values and charge accordingly. Otherwise, they will quickly find themselves out-of-the-job and in the hole financially. Many things go into the cost of transporting a car. While some of these costs may seem small and insignificant, they can add up quickly, especially for an owner of a transport service. So, as you look at transporting your car, keep these factors in mind. Be sure to get quotes from a wide range of car transport companies to see who is offering the best service at a reasonable price. But, keep in mind you should not go with the cheapest option you find, as they may not be doing things the right way and it can leave you regretting the choice in the end. Call us at 1-800-516-3440 for .